@fskreuz what did you use to create that gif? Oooh. That's a neat device. But a few dollars more, you could get the M3 variant of the SP4. hi! so excited to see web site updated. looks great! and 0.9 out. thanks for all the hard work! I am having issues with using webpack and ractive-component-loader with ractive 0.9. I am getting this error: "Uncaught TypeError: Ractive.extend is not a function" on this line in the output generated by the ractive-component-loader: "module.exports = Ractive.extend(component.exports);"
In the changelog i see there are warnings about using Ractive extend... is it related to that? Thanks! Hmm... we might want to know what this component.exports contains. true. will log that and see what it contains. that sort of Ractive.extend(compont.exports) line is relatively standard in a lot of component loader-y type things though. 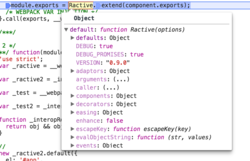 Assuming component.exports is the component.exports of a component file, I don't see anything problematic. A Ractive global without the extend function seems strange though. If you don't mind, can you also log what Ractive.extend is? I have this feeling something else in the code is injecting a custom extend property. hmm. is something to do with 0.9 being more es2015-ish? not sure how to add screenshots in gitter without hosting them somewhere. You can simply drag the screenshot to gitter and it uploads it for you. An issue with a repro or link to a demo repo would be nice too. That way, we can also look into it. Sure. Will work on it. Have screen shots of the Ractive.extend in the mean time. Are you by any chance using the mjs bundle on the 0.9 one? Also seeing a var Ractive = ... on the 0.8 shot. Can we get the entire expression on both? It might give a hint as to what got assigned to Ractive. Aha! Webpack might be picking that up. Not sure how Webpack behaves when it sees "jsnext:main": "ractive.mjs", in the package.json. 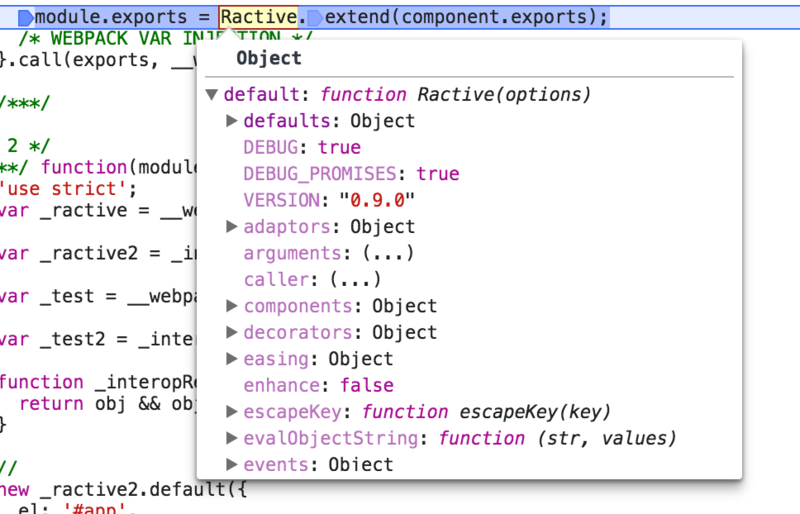 Also not sure what Webpack returns when modules call require('ractive'). Assuming it equates to something like import * as Ractive from 'ractive' instead of import Ractive from 'ractive', it might explain why it's returning an object with thedefault property and not the default export (which is the function). currently i have not been applying babel to packages in the node_modules folder. if i do run babel on node_modules it compiles out fine also. this gives me something to go on. thanks! on a related but slightly different note: is anyone else using ractive, webpack and components and not using ractive-component-loader? i feel like that every time ractive updates (well, that's a slight exaggeration... the 0.8 update ... :smile: ) i ask about a components loader issue! maybe there is a better way?! i am sure there is! that would be great! how would the ractive bin work with webpack? would we need a loader for it?